After defeating Pyramid King Jindai and declining the offer to be a Frontier Brain, Satoshi sets off to travel through the far away land of Sinnoh. Once he gets there, he meets up with Hikari, a local trainer from the region, and they decide to travel together. 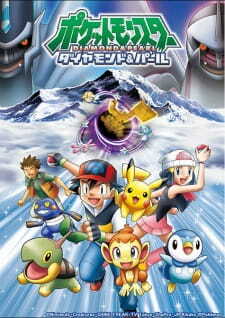 In the US, the second season of Pokemon: Diamond and Pearl is called Pokemon: Battle Dimension (Pokemon Season 11). I'm not very good at writing professional looking reviews. But I like this season because this is the season that made me get into Pokemon again. When I was very young. I like many kids watched Pokemon. But over the years, I didn't watch it anymore. At age 21 or 22, I decided to look up Pokemon online. One of the 1st eps I watched was from Diamond & Pearl. I did get confused cause I saw Dawn. And I knew that I missed alot. So I started from ep 1 of the Pokemon series. And watched every show and movie. And ever since Ive been hooked! I'm going to start off my review by stating that I will treat Pokemon D&P as a full flege anime and negate from the games and other chilhood influences. At this point it should be noted that Pokemon D&P is apart of the long running Pokemon FRANCHISE. A franchise that has a basic formula. That formula is aimed towards kids so there will be a lot childlike situations and themes. It just so happens that that formula continues to be reused time after time again. Its old to a lot of veteran viewers but new to the younger and newer generations. However, despite D&P being a "rehash", it still finds it's place amongst the other series. Story: Satoshi or Ash for us American viewers is traveling by himself as he makes his way to the Sinnoh region. He eventully meets up with his long time traveling friend Takeshi/Brock and a new friend Hikari/Dawn. Like the other series, Ash along with his friends explore the area they are currently in while seeing and capturing new Pokemon, participate in Gym battles, make new friends and rivals, battle Team Rocket all while learning about growing up, friendship and other themes of such nature. Art: Compared to the older series, D&P is a step up in the art department. Of course the original has a nostalgic touch to it and Advance Generation has that sequal value but D&P is very vibrant in color. The environment is abosulutely beautiful and the way that some of the attcks look are perfect! It appears as if some of the attacks have texture to them. Somthing the recent series have picked up and started doing. the characters are drawn well. Although Ash and Dawn are 10 they very well look like they are at least 13 giving off a more mature appeal. Sound: The music is good. It's not "rock your socks off" good but for its target audience, it gets the job done. A lot of the battle and travel music returns from the previous shows so if your a fan of those, you're in for a treat. The sound effects are good like the colision of attacks or something simple like the characters walking. Character: Out of all the catergories in this review, the character catergory got the lowest rate. Ash and Brock are pretty much the same. They don't develop much however the introduction of the Sinnoh rival Shinji/Paul does add a bit of flare to something that was very well missing in Ash's life after the absence of Gary. Paul did in fact challenge Ash. I won't say that he helped Ash develop his style of battling. That actually came over the course of the series but Paul was serious about his job as a trainer. He was a tad bit cliche with the whole "pokemon are tools" outlook but nonetheless he gave Ash a run for his money. I was a bit disappointed with Dawn. Despite being the female lead to level out the male ratio, she didn't do much for team development and was a bit of a wasted character. Like her previous female lead, Haruka/May, Dawn is a Pokemon Coordinator. The main difference is that Dawn starts off as a coordinator while May grew into it. Also Dawn is the child of a famous coordinator. But that's really it. Dawn isn't that great at coordinating (at first) and the series introduces her as a rookie. She pretty much was in the same spot as May. When it comes to the overall character of Dawn, she felt forced. Forced to be liked because she was a good guy. Forced because she had a dream to be a coordinator. Forced because when she felt sad, the viewers ahd to feel sad as well. Honestly, I would've liked Dawn more if she was already somewhat advanced in her craft similar to Misty. The dynamic would've changed greatly if Dawn wasn't your avergae Pokemon rookie. The coordinator thing has already been done and it doesn't help that the previous female lead was more profound in the skill than the current. The rest of the characters were either short lived or not memorable. Did I mention that Team Rocket is still trying to capture Pikachu? Enjoyment: I enjoyed D&P fairly well. As expected, things have changed but it's a new enviornment with the same fundamentals. Overall: Pokemon D&P is an upgrade in the battle sequences, the story and is overall is visually stunning. Unfortunately the characters were lacking. Paul was an interesting add to the series but Dawn was a step backwards from the other two female leads especailly since she gave no reason to be liked or rooted for other than the fact that the audience is SUPPOSE to like and root for her. However if you've been riding the Pokemon train this long, why stop here? It's a decent addition to the series and it came at a good time where things were getting stale. Pokemon D&P defintely holds a place in the Pokemon family tree and is sure to be liked by the younger generations and the veterans who know how the Pokemon formula goes. Pokemon: Diamond and Pearl anime was definitely an enjoyable series for me. I liked all the new Pokemon introduced in Sinnoh with appearances from some of the more classics too. This is the one series where I felt Ash/Satoshi did his best battling wise. A great aspect to this was his rival, Paul/Shinji. The two had completely different views on how they were training their Pokemon and battling. It led to a great strong rivalry and was the main reason he did so well. The gym battles were great, team rocket was still funny as ever although i wish they didn't always appear in every episode. The plot with Team Galactic was entertaining. Now for my favorite part, the Sinnoh league. This was by far the best league Ash battled well in, and it's also the first league where most of his Pokemon team was fully evolved with the exception of Buizel and Gibble but they were still awesome. The strategies used were amazing especially on Ash's part. The final battle with Paul was simply great! the one thing I didn't like was how the league ended. In my opinion, I believe the anime should have ended with this series because of good things were with it. Overall an enjoyable series for me. Sounds alright, good background music in japanese version. The characters are more developped and they're not all 'black and white' like they used to be. Nice anime to watch, not too serious but can be when needed to. Overall nice, no real action, the plot is spread over 200+ episodes with mostly fillers. Art's not always the best but major episodes are mostly done nicely. Pokemon USA doesn't edit episodes any more so there isn't that much difference in dialogue and plot. I personally watch mostly the more serious episodes but the fillers are more humourous. Give it a try, it's worth it. Over the years, Ash Ketchum (Satoshi) has traveled to many different regions in the Pokemon world. Each new region brings a new generation of Pokemon with it and the anime features Ash and his pal Pikachu catching a new team of Pokemon with each new adventure. Pokemon is popular as ever, and we are here to show you five figures which can help you become the best Pokemon figure collector there is!